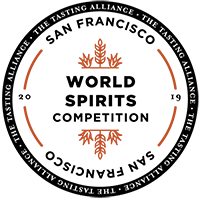 Promote your award-winning spirits with images of your 2019 SFWSC medallion. Double Gold, Gold, Silver, and Bronze Medal award imagery is now available for use in your online and print promotions. Two CMYK color images of your award, ideal for most print applications, measure 1,750 × 1,750 pixels, with a resolution of 350 dpi. Versions include a layered Photoshop (.psd) document with an optional light drop shadow and transparent background. For online use, we provide a low-resolution RGB image that measures 400 × 400 pixels, with a resolution of 72 dpi. The image contains a transparent background for imposing over any background and contains a light drop shadow for visual depth. This Adobe Illustrator EPS file is a fully scaleable black-and-white graphic image like that used to produce your actual medallion. It is provided for your convenience should you require a unique application of the image, such as engraving, etching, embossing, spot-color printing, etc. TERMS OF LICENSE: There is a one-time licensing fee of $200 per award level (Bronze, Silver, Gold, or Double Gold), per winning spirits product. The license permits any person or agency promoting the product unlimited use, in perpetuity, of the San Francisco World Spirits Competition medallion imagery in any advertising, collateral, point-of-sale, public relations, or any other promotional channel pertaining to the product to which the medal was awarded and the license was granted. The license to use the image is not transferable for the purpose of promoting any other product, nor may it be used for any other purpose than to promote the award-winning product specified in the license.